I admit that I’m not much for Christmas songs and carols but one of my favorite tunes for this time of the year is “What Are You Doing New Year’s Eve?,”especially if it is sung by Harry Connick, Jr. I love new beginnings and fresh starts. I enjoy reflecting on what has gone by and thinking about the blessings of the previous year and the ones to come. These tidbits of personal information really have nothing to do with youth services in libraries. Except that the question raises the idea: Whose new year? When do the people in our communities celebrate the new year? Does everyone celebrate only on December 31 and January 1? New year’s provides some great opportunities for multi-cultural and multi-language programming and, since not everyone recognizes January 1 as the start of the new year (or the only start), diversity offers on-going possibilities for more fresh starts. In many parts of the world January 1 begins the new year, but how we celebrate and the traditions we observe can reflect cultural differences. 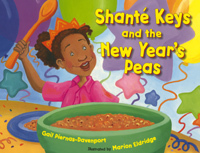 Shanté Keys and the New Year’s Peas by Gail Piernas-Davenport explores the Southern tradition of eating black-eyed peas for good luck. Make party hats before reading the story and enjoying a spo onful of black-eyed peas. A great activity guide is available on the Albert Whitman website. It is also a story that can lead to a discussion of how and when the new year is celebrated in other cultures, as Shanté Keys learns about Chinese New Year and Diwali. Chinese New Year is more appropriately called the Lunar New Year as it is celebrated in many Asian cultures and may be referred to differently in some countries. Based on the lunar calendar, the date is moveable and falls in late January or early February. In 2013 it will fall on February 10, although celebrations often last for two weeks. Many libraries do programming for this holiday but expand the cultures by using stories like The Runaway Rice Cake by Ying Chang Compestine, an original tale that is reminiscent of The Gingerbread Boy, which includes a recipe for nií¡n-gí¤o (rice cake). Share Janet Wong‘s poem, “Korean New Year” that mentions several Korean traditions. It is included in El dí­a de los niños/El dí­a de los libros: Building a Culture of Literacy in Your Community through Dí­a, along with other program ideas for various new year celebrations. Filipino Celebrations: A Treasury of Feasts and Festivals by Liana Romulo provides activities and foods, often with words in Tagalog, for both December 31/January 1 and the Chinese New Year. The list of various other new year’s celebrations could go on and on. The Russian Orthodox community observes the new year according to the Julian calendar, which places the day on January 14. Thailan d celebrates Songkran as the new year in mid-April. People often tie strings around each others wrists to show their respect, leaving the strings on until they fall off naturally. The ancient Greeks began their new year with the new moon after June 21. The Islamic new year is based on the lunar calendar so varies from year to year but will begin on November 5 in 2013. Rosh Hashanah is the Jewish new year and also falls in the autumn. New Year at the Pier by April Halprin Wayland explores tradition of reflection on past mistakes, casting them away, and starting the year with a clean slate. There are many opportunities to start anew and to encourage diversity and cultural understanding throughout the year. So…I ask again: What are you doing New Year’s Eve? Share your programming ideas now and throughout 2013. And have a Happy New Year, whenever you celebrate! 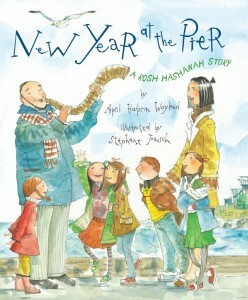 Thank you kindly for mentioning New Year at the Pier! It was exactly my intent for people to use this book during both January 1st New Year celebrations and Jewish New Year celebrations. Thanks for adding the extra information! Happy 2013 to you…and again later in the year.